When three of the most outstanding bands the Greek alternative music scene has produced in recent years come together for a joint live show, chances are it is going to be something special. Indeed, the recent appearance of Underwater Chess, One Hour Before The Trip and Their Methlab at Temple in Athens turned out to be a quite remarkable evening, a unique musical gathering of high standards – and spirits. Covering a wide range from post rock and metal to punk and electronica, the bands delivered some exhilarating performances, thus proving that truly authentic and elevating music is still out there, for all those willing to explore and go beyond the fringes of today’s largely commercialized and market-oriented music productions (perhaps ‘products’ would be a better word). Contemporary music could definitely use more experimentation, innovation, and personal expression – elements found in abundance in all of the aforementioned bands, which will surely continue to entice and entrance audiences both around and -hopefully- beyond Greece. This entry was posted in Concerts and tagged Athens, OHBTT, One Hour Before the Trip, post-rock, progressive, Temple, Their Methlab, Thessaloniki, Underwater Chess on February 16, 2019 by The Muser. Socrates Drank the Conium were undoubtedly the most important exponents of the Greek rock scene throughout the 1970s and up to the early 1980s. Their name has attained a somewhat legendary status and commands considerable respect among Greek rock fans and critics up to this day. Although the name ‘Socrates Drank the Conium’ first appeared in 1969, the story of the band goes back to the time when fellow high-school students Antonis Tourkogiorgis and Yiannis Spathas formed The Persons. The impeccable synchronization and exemplary blending of Spathas’s guitar playing with Tourkogiorgis’s distinctive use of bass was evident from early on, as was the potential for the remarkable compositions that were about to emerge. After releasing three singles and making several live appearances as Persons, they changed their name to Socrates Drank the Conium (or simply Socrates, as friends and fans would end up calling them) and made their recording debut (Socrates Drank the Conium, 1972) as a trio, with Elias Boukouvalas behind the drums. The album is characterized by an explosive mix of blues, heavy rock and psychedelic elements much akin to the sound of bands like The Jimi Hendrix Experience and Cream. Apart from such obvious influences, other artists that had a significant impact on Socrates included Ten Years After, Fleetwood Mac, John Mayal, Free and Led Zeppelin. Despite the rather poor production and the unhelpful recording conditions, which also concern their next album (Taste of Conium, 1972), Socrates’ powerful message got through and resulted in a warm reception from both Greek public and press of the time. The band’s biggest asset was undeniably the astonishing technique of guitarist John Spathas whose virtuosity and musicality produced results of exceptional power and expressiveness when combined with the band’s rock-solid rhythm session. In addition, the frequent incorporation of traditional Greek elements in Spathas’s guitar passages and solos would also become one of the band’s trademarks and most significant innovations. The introduction of Live in the Country – the very first song in Socrates’ recording career – is a brilliant demonstration of Spathas’s skillful guitar playing and highly idiomatic musical language, which arises from a combination of a Hendrix-like sound and elements of Greek folk music. By the time their third album (On the Wings, 1973) hit the shelves, Socrates had already attained a preeminent place amongst contemporary Greek bands. Having played at most of the major venues in Greece but also elsewhere in Europe (including club Paradiso in Amsterdam), Socrates became known for the forcefulness and electrifying atmosphere of their live performances. The creative course of Socrates culminated in the mid-1970s, when their collaboration with keyboardist and composer Vangelis Papathanassiou (who had also been a member of Aphrodite’s Child) led to the release of Phos (1976). Vangelis’s touch gave the band a more lyrical and elegiac sound that is clearly distinguishable throughout the album. Recorded in London, Phos (“light” in Greek) stands out as the crowning achievement of not just the band, but the entire Greek progressive rock scene of the era. The album contains pieces of profound beauty such as Queen of the Universe, as well as a popular rendition of Starvation, which had appeared on the band’s debut album. The indisputable highlight, however, is Mountains (which would be re-recorded again in 1980), where Spathas embarks on an improvisatory trip of monumental scale, showcasing his exceptional guitar technique and unique assimilation of Greek folk musical idioms. In the early 1980s, Socrates returned with two more noteworthy attempts (Waiting for Something and Breaking Through) and a couple of years later the band released its swan song (Plaza, 1983), having a last shot at international fame. Just before the turn of the millennium Socrates came together for a series of concerts which resulted in the release of their live album Live in Concert ’99, a record that effectively summarizes their long and remarkable career. This entry was posted in Various and tagged 1970s, 1980s, Aphrodite's Child, Greece, guitar, Mountains, Phos, progressive, rock, Socrates, Spathas, Starvation, Vangelis on June 23, 2013 by The Muser. I have to admit I don’t go to concerts as often as I used to (or would like to, for that matter). But lately I’ve been trying to get back in touch with Amsterdam’s vibrant music scene. I’m not talking big names or venues here, but mostly intimate gigs of lesser-known local bands. One such case is the blues/garage rock duo The Shady Greys. As both their name and songs suggest, their ‘grey’ sound lies somewhere in between The Black Keys and The White Stripes, marked by fuzzy guitar riffs and the use of the cajón. More on the psychedelic side of things, The Full Wonka is another local band whose atmospheric, experimental sound produces a hypnotizing effect. Watching them live and listening to their tunes brings to mind bands like The Brian Jonestown Massacre and The Velvet Underground. Only a fragment of Amsterdam’s alternative rock music scene, these bands nevertheless capture most of its essential qualities: energy, enthusiasm, spontaneity and -perhaps most importantly- genuine expression of feeling coupled with lots of fun. This entry was posted in Various and tagged Amsterdam, bands, blues, concerts, garage, gigs, live, progressive, psychedelia, rock, underground on May 10, 2013 by The Muser. The new EP by Joalz Hello Darkness My Friend is exactly what its name suggests: An intriguing invitation to explore dark, otherworldly soundscapes. Sharing their time between Greece and Germany, Joalz decribe their music as “a weird kind of obscure indietronica.” Recorded in Berlin and Athens between March 2011 – June 2012, Hello Darkness My Friend is influenced by the sound of early Krautrock, psychedelia and progressive rock (think of Amon Düül, Can or Aphrodite’s Child). Each song has a completely unique atmosphere; the opening track ‘Oh darling Margaret’ is haunted by the sound of the theremin, whereas in ‘Outspoken you are’ Mary Tsoni’s powerful reciting soars against a dazzling sonic background (the song’s B&W video was shot in Manhattan’s Chinatown). I found particularly interesting the band’s rendition of ‘Alligator Wine’ (originally recorded by Screamin’ Jay Hawkins in 1958), where Tsoni’s theatrical performance and the fuzzy guitars blend into a peculiar kind of post-apocalyptic blues with dark overtones. Next to a remarkable new wave of Greek artists, Joalz with their Hello Darkness My Friend offer yet another example of how creativity and experimentation can spring up amidst such grim times for Greek society. This entry was posted in Album reviews and tagged Aphrodite's Child, Athens, Berlin, electro, experimental, Greece, indie, Joalz, krautrock, progressive, psychedelia, review, rock on April 29, 2013 by The Muser. These last few days, after reading the news about Storm Thorgerson’s passing away (the man responsible for several iconic record sleeves), I have been pondering on the very special relationship between music and cover art. Aesthetically speaking, I have always regarded the artwork of an album at least as important as the music it contains. Great album covers often attracted my attention and curiosity while I would browse through records in some store, resulting in my acquaintance with many exciting and undiscovered soundscapes. In fact, the cover’s artwork has often been my very first impression of a music album. It was through their intriguing, mystifying covers that I was first introduced to many classic records such as Houses of the Holy, Wish You Were Here or Dark Side of the Moon, all designed by Storm Thorgerson. Another work by Thorgerson I have always admired is his cover design for Pink Floyd’s A Momentary Lapse of Reason. The cover shows 800 hospital beds, arranged in a river-like form on a beachfront location (which is Saunton Sands in Devonshire, UK). The image took about two weeks to create and won the photographer Robert Dowling a gold award at the Association of Photographers Awards. The association between sound and image can be crucial for an album’s thematic coherence, conceptual effect and aesthetic value. It is hard to imagine someone listening to The Wall, Sticky Fingers or The Velvet Underground & Nico without simultaneously thinking of their accompanying cover art. Some of the best album covers, as in Thorgerson’s work, have their origins in progressive rock. One of my all-time favorites is the artwork for King Crimson’s In the Court of the Crimson King, which so powerfully captures the atmosphere of impending paroxysm and paranoia described in the album’s opening track 21st Century Schizoid Man (Barry Godber, who painted the album cover, died in 1970 of a heart attack shortly after the album’s release). 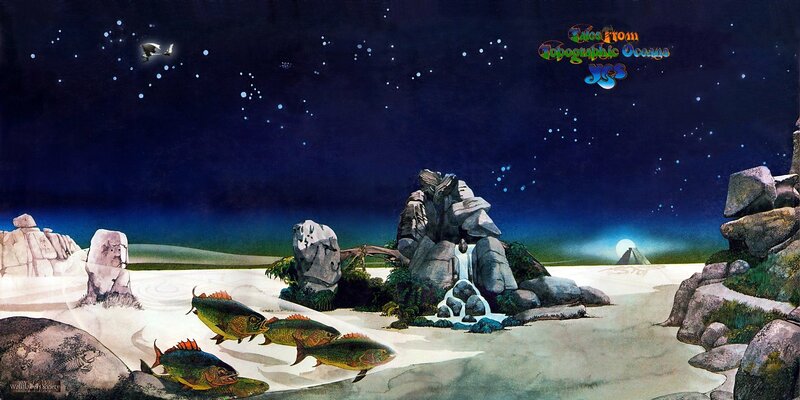 Another artist I have always admired is Roger Dean, whose designs have been on album covers by bands such as Babe Ruth, Budgie, Uriah Heep and Gentle Giant. A truly imaginative and original artist, Dean is most well known for the amazing fantasy landscapes he has produced for the progressive rock bands Asia and Yes. Examples like the collaboration between Pink Floyd and Storm Thorgerson or Yes and Roger Dean illustrate how cover art can play an integral part in shaping a band’s identity. Masterful works of art in their own right, albums covers can both complement and enhance a band’s artistic image. This art form, however, has been traditionally associated with vinyl, where the cover design has the necessary breathing space in order to create the desired aesthetic effect. In the era of digital music and massive downloading, it is doubtful whether cover art for music albums will continue to have the same prominence and importance. I, for one, sincerely hope it will. This entry was posted in Various and tagged album, art, cover, design, illustration, photography, Pink Floyd, progressive, rock, Roger Dean, Storm Thorgerson, Yes on April 22, 2013 by The Muser.